Politicians Ignore Women with Inconvenient Views. November Can Change That. Women’s opinions on Brett Kavanaugh were ignored and their accusations of bullying by John Bercow have been turned into political ammunition. If American women vote in force during the midterm elections and Britain’s female leaders make progress on Brexit, next month could see politicians in both countries finally value women as more than disruptive influences and strategic victims. Both Republicans and Democrats treated Dr Christine Blasey Ford’s claim - that Kavanaugh sexually assaulted her when they were teenagers – as a political tool during Kavanaugh’s Supreme Court confirmation hearing. Republicans undermined her accusation by suggesting she was mistaken about the identity of her assailant, while Democrats were more interested in derailing the judge’s appointment than her wellbeing. Republican Senator Lisa Murkowski’s refusal to bend to partisan expectations and support Kavanaugh was branded “disgraceful” by Donald Trump – no surprise given the president’s history of misogyny. The hundreds of women who protested the confirmation and the dozens who confronted legislators with their stories of sexual assault were roundly ignored. 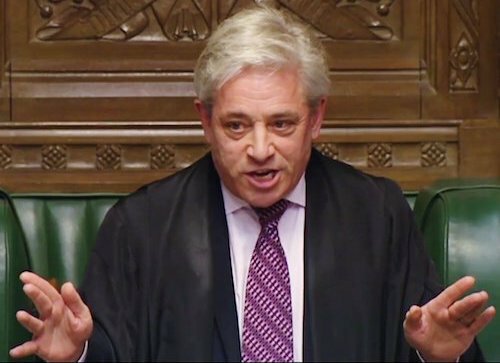 In the UK, Pro-Brexit politicians have weaponised women’s allegations of bullying and harassment in the government to oust Bercow – who is anti-Brexit - and appoint a more favourable Speaker of the Commons. Meanwhile, Remainers such as Labour MP Ben Bradshaw and Dame Margaret Beckett prefer to ignore the inconvenient claims: “Brexit issues trump bad behaviour’”, Beckett has stipulated. Their politicisation of victims is echoed by Tommy Robinson, the founder of the far-right English Defence League. Robinson fuels his anti-Islamic crusade against grooming gangs by highlighting the plight of white women, yet he ignores the insistence of victims that white men are also prevalent in the grooming scene. Unsurprisingly, women are fighting against being silenced and deployed as political missiles. In the UK, Prime Minister Theresa May’s female cabinet colleagues have stood by her as militant Brexiteers deride her negotiating position as disastrous and unstable. Andrea Leadsom, Claire Perry, Caroline Nokes and Justine Greening have all expressed discomfort with ex-Foreign Secretary Boris Johnson’s demands to throw out her proposed deal, arguing ‘Chuck Chequers’ is a dangerous rallying cry of male political adventurism. In the US, unprecedented numbers of women are running for political office, which could result in a record number of female Representatives in the House after the midterms. Alexandria Ocasio-Cortez’s defeat of long-serving Representative Joe Crowley in June shows women are ready to overturn the establishment and transform the make-up of US government. Women’s pent-up frustrations with the status quo could be released in both the UK and US in November. The Brexit negotiations give May an opportunity to showcase her capacity for governance and quash uncertainty and discontent, while American women have an unprecedented opportunity to elect a new generation of female politicians and improve the gender balance in government. Failure in either of these pursuits would be disappointing, but if women's perennial fight for political inclusion is any indication, it would only fuel their resolve to achieve equality.